FIGURE 1. Long axis parasagittal image of the right lobe of the pancreas (+ symbols) from an 8-year-old dog. The pancreas is slightly hyperechoic (typically is iso- to hypoechoic) relative to the surrounding mesentery. The pancreas is a lobulated, thin, elongated organ that is divided into three parts: the right lobe, the left lobe, and the body. It is one of the most difficult structures to identify in the normal patient due to the similar echogenicity and echostructure of the pancreas and the adjacent mesentery and fat. Patients with pancreatitis often have significant cranial abdominal pain and resist the pressure of the transducer that is necessary to image the region. Therefore, appropriate sedation and analgesics should be considered to improve image quality and diagnostic accuracy. FIGURE 2. Transverse CT image at the level of the cranial descending duodenum in a dog (the dorsal aspect of the patient is at the bottom of the image, and the right side of the patient is on the left side of the image) (A). The right lobe of the pancreas (white arrow) is seen as a triangular structure along the dorsal aspect of the descending duodenum (DD), and the left lobe of the pancreas (#) is to the right of the gastric lesser curvature. 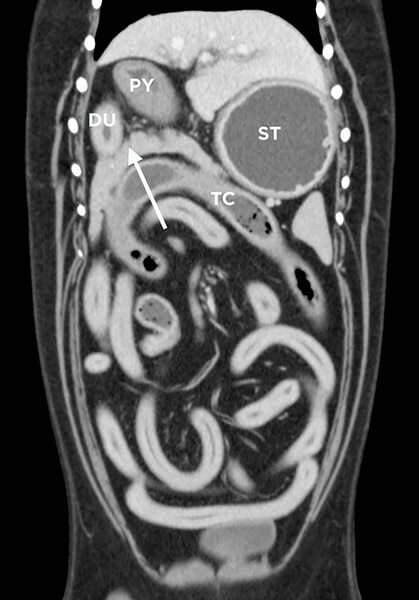 Transverse ultrasound image at the level of the right kidney (RK) in the same dog as Figure 1 with the descending duodenum (DD) in cross section and the right lobe of the pancreas representing the mildly hyperechoic triangular structure to the right (medial) of the descending duodenum (B). 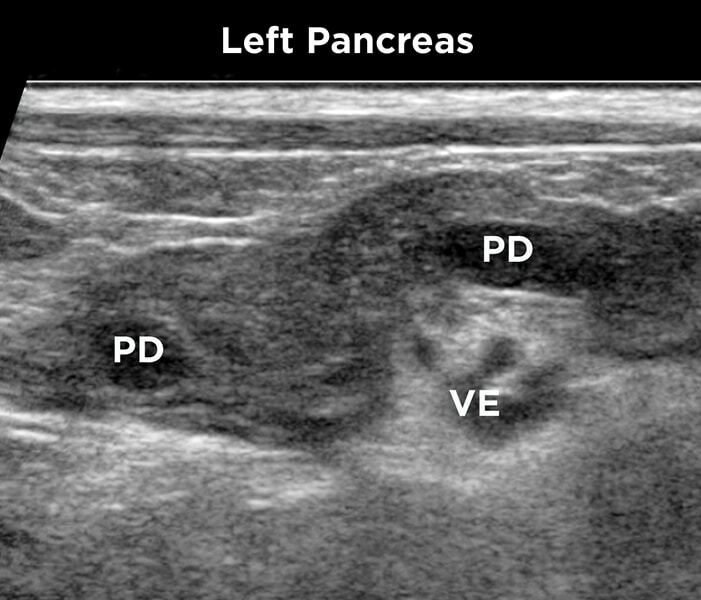 The pancreaticoduodenal vein is visible as a rounded, anechoic structure between the duodenum and pancreas. ST, stomach; CA, caudate lobe of the liver. The right lobe is the largest lobe in the dog and extends caudally and parallel to the descending duodenum. This lobe can be evaluated using a ventral or lateral approach. When using the ventral approach, place the transducer medial to the right 13th rib and angle dorsally and cranially to get the right kidney in long axis. Next, angle medially to find the descending duodenum. Moving the transducer medial to the descending duodenum will allow one to identify the location of the right lobe of the pancreas (FIGURE 1). In the dog, the pancreaticoduodenal vein can be an anatomic landmark for the right lobe of the pancreas adjacent to the duodenum. To image the right lobe in cross section, first the duodenum is imaged in long axis, the transducer is then rotated 90 degrees to obtain a cross section of the duodenum, and the right lobe will be visible as a triangular structure immediately adjacent to the duodenum (FIGURE 2). In the cat, the right lobe extends along the descending duodenum and then hooks back on itself (FIGURE 3). The right lobe of the pancreas and the descending duodenum are closer to a midline position when compared to the dog. FIGURE 3. 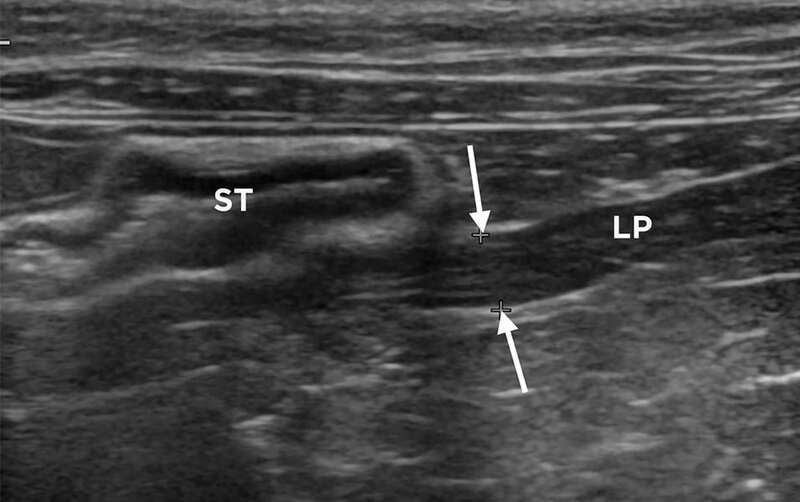 Longitudinal (sagittal) B-mode ultrasound image medial to the descending duodenum from a normal cat. The tip of the right lobe (RP) of the pancreas can be seen turning back in a cranial direction (white arrow), forming a hook. The pancreas is hypoechoic to the surrounding mesentery and measures 5 mm in its thickest area. RK, right kidney. FIGURE 4. Sagittal reformatted CT image of the abdomen from a dog (the cranial aspect of the patient is on the left side of the image, and the dorsal aspect of the patient is at the bottom of the image) (A). Long axis ultrasound image from a cat (B). In both images, the portal vein (PV) is dorsal to the pancreas (white arrow). ST, stomach; GB, gallbladder; CVC, caudal vena cava; LI, liver. The left lobe extends to the left of midline, near the cranial pole of the left kidney, but rarely to the level of the splenic hilum in the dog. The left lobe is closely associated with the greater curvature of the stomach and found in a region bound cranially by the stomach, caudally by the transverse colon, and, in the near field, by the body of the spleen; it is closely associated with the splenic portal vasculature (FIGURE 4). In the cat, the left lobe of the pancreas is larger than the right lobe and extends to the left close to the splenic hilum (FIGURE 5). FIGURE 5. 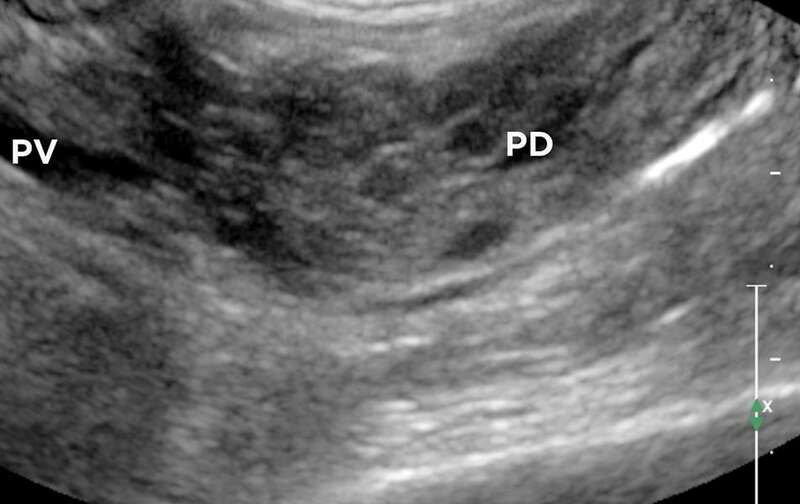 Transverse ultrasound image of a cat’s left cranial abdomen caudal to the stomach (ST), showing the left pancreatic lobe (LP) in long axis extending across the screen. The left lobe of the pancreas is normal, measuring 4 mm thick (white arrows), and is hypoechoic relative to the surrounding mesentery without any mesenteric reaction. The spleen is located just out of plane to the right of the image. In the cat, the body of the pancreas and the pyloroduodenal junction are in a more midline position (Figure 6). FIGURE 6. Dorsal CT image from the abdomen and caudal thorax of a cat with chylous pleural effusion (PE) (the cranial aspect of the patient is at the top of the image, and the left side of the patient is on the right side of the image) (A). The body and left lobe of the pancreas (red arrows) are located ventral to the portal vein (PV). Oblique imaging plane (long axis) ultrasound image of a normal cat with a hypoechoic left lobe of the pancreas (white arrows) and hyperechoic surrounding mesentery (B). The pancreas measures 6 mm in thickness and the pancreatic duct (PD) measures 1.7 mm in diameter, both of which are considered normal for a cat. ST, stomach; SP, spleen; PV, splenic portal vein dorsal to the left lobe of the pancreas. FIGURE 7. Dorsal plane CT image from a dog where the right, body, and left lobes of the pancreas are visualized. The pancreas is the horseshoe structure indicated by the white arrow. ST, fundus of the stomach; PY, pyloric antrum; DU, duodenum; TC, transverse colon. Patient factors also play a role in ultrasound imaging. Excessive aerophagia and inadequate fasting often result in significant shadowing and reverberation artifacts from the gastric contents. These artifacts will likely obscure the region of the left lobe and body of the pancreas, making assessment of these structures challenging or impossible, particularly in dogs. The normal pancreas, if visualized, is isoechoic to slightly hypoechoic to the surrounding mesentery. The boundaries of the pancreas are delineated by thin hyperechoic lines. The normal canine pancreas is 6 to 8 mm thick with a pancreatic ductal diameter of 0.6 mm. The normal feline pancreas is 4 to 6 mm thick with a pancreatic ductal diameter of 1 mm. As cats age, the pancreatic ductal diameter can measure up to 2.5 mm without evidence of pancreatic disease (FIGURE 8). Occasionally, a pancreas can be diffusely hyperechoic but still measure within normal limits for thickness (FIGURES 1 and 7). Histopathology in dogs with a hyperechoic pancreas has been normal to fibrotic from what was believed to be prior pancreatitis. FIGURE 8. Pancreatic ductal dilation (PD) in an older cat without clinical or biochemical evidence of pancreatic disease. The pancreas is hypoechoic to the surrounding mesentery, and the overall pancreatic thickness is 7 mm. The ductal diameter is 2.2 mm, which is still within normal limits in a geriatric cat. The most common abnormality of the canine and feline pancreas is pancreatitis. 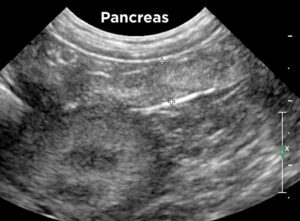 Pancreatitis can have a variety of ultrasound abnormalities depending upon the severity, extent, and duration of the pancreatic and peripancreatic changes.1 Detection of pancreatitis on ultrasound may be difficult as the pancreas can appear ultrasonographically normal. A normal appearing pancreas does not rule out pancreatitis. In acute pancreatitis, the pancreas can become enlarged, hypoechoic, and rounded or irregularly marginated. 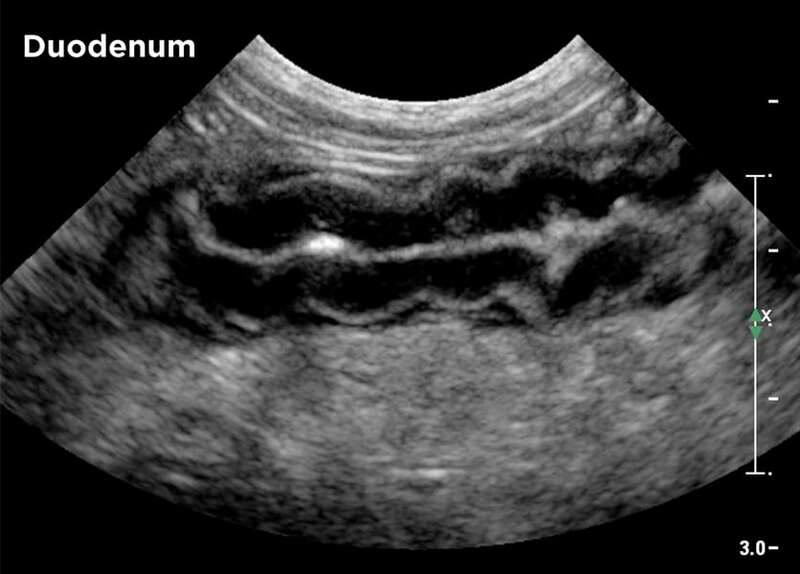 The surrounding mesenteric fat is hyperechoic and hyperattenuating, and there is often mild to moderate collections of echogenic effusion in the area of the inflamed pancreas (FIGURE 10), representing peritonitis and/or fat saponification. Fat saponification is also known as steatitis. FIGURE 9. 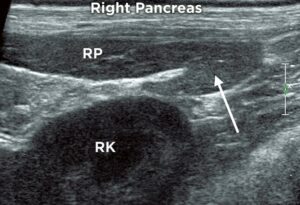 Short axis (transverse) ultrasound image of the left cranial abdomen showing a long axis image of the left lobe of the pancreas in an older cat with nodular hyperplasia. Notice the irregular margins of the pancreas and the hypoechoic nodules within the pancreas. On histology, these were areas of nodular hyperplasia. PD, pancreatic duct; PV, splenic portal vein. The duodenum and/or stomach wall can be thickened due to secondary inflammation of this area. A focal paralytic ileus and corrugation of the duodenum can be present (FIGURE 12). In these patients, the wall layers will be altered but there will not be total loss of wall layering as seen in neoplastic processes of the stomach and duodenum. Rarely, the colon (ascending or transverse) can be involved. In some dogs and cats, the ultrasound findings lag behind clinical signs, and the initial ultrasound may be normal. Conversely, recheck ultrasound scans can document persistent severe changes while, clinically, the patient is doing better and is back on a feeding regimen. FIGURE 10. Severe pancreatitis in a dog with a large, ill defined, hypoechoic mass (PA) noted in the mid to far field and surrounding irregularly marginated, hyperechoic mesentery (ME) consistent with fat saponification and peritonitis (A). On color Doppler evaluation, there was no blood flow noted in the pancreatic mass, which is consistent with necrosis. Pancreatitis in a cat with an ill defined, enlarged, anechoic pancreas (PA) with increased echogenicity surrounding the pancreas in the mesentery (ME) (B). This is consistent with regional peritonitis and steatitis associated with pancreatic inflammation. In the area deep to the inflamed pancreas and mesentery, there is marked attenuation of the ultrasound beam (AT) secondary to the severe regional steatitis. In cases of necrotizing pancreatitis, hypo- to anechoic regions of hemorrhage and necrosis can be seen. 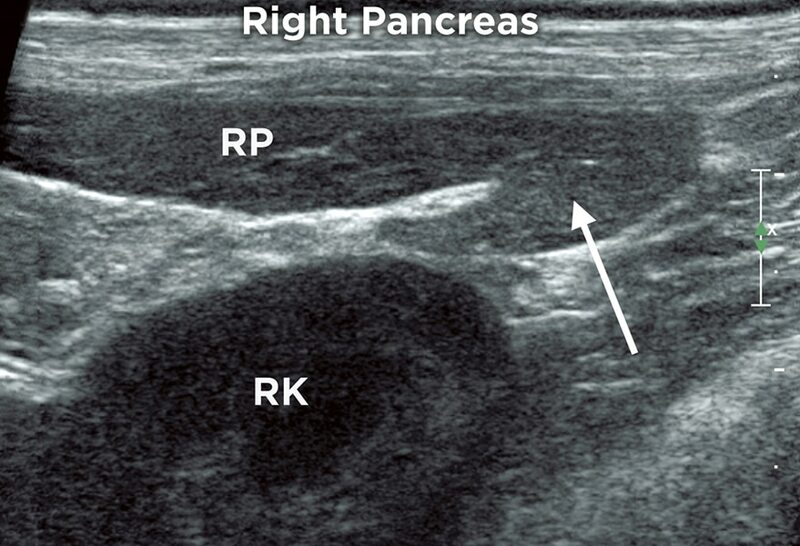 One can use color or power Doppler to assess for blood flow in areas of the pancreas that are affected, in order to rule out necrotizing pancreatitis, although motion artifacts often make accurate color Doppler examination challenging in these patients with cranial abdominal pain. Possible sequelae to pancreatitis include pancreatic cysts (retention cysts or pseudocysts) or abscesses. Pancreatic cystic lesions typically form rounded, anechoic structures associated with distal enhancement artifact; however, it is not possible to differentiate between congenital cysts, pseudocysts secondary to cavitation from pancreatitis, and retention cysts secondary to ductal obstruction. FIGURE 11. Dystrophic mineralization (white arrows/MI with distal acoustic shadowing) within the areas of prior fat saponification secondary to pancreatitis in a dog. 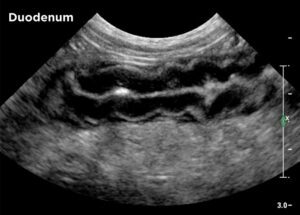 The descending duodenum (DD) is fluid distended consistent with an ileus secondary to a current bout of pancreatitis. PA, pancreas; PV, portal vein. FIGURE 12. Corrugation of the descending duodenum in a dog with pancreatitis in the right lobe. The duodenum is corrugated secondary to the surrounding pancreatic inflammation. The mesentery deep to the duodenum is hyperechoic as a result of focal steatitis and peritonitis. The appearance of a pancreatic abscess is similar to that of other intraabdominal abscesses. Abscesses are associated with distal acoustic shadowing but may, in addition, have a thick, irregular wall associated with perilesional inflammation (markedly hyperechoic fat and effusion) and may also show reverberation artifact from gas producing bacteria. Another common sequela of pancreatitis is extrahepatic obstruction of the common bile duct, resulting in dilation of the common bile duct, cystic duct, gallbladder, and eventually extra- and intrahepatic biliary ducts (FIGURE 13). In the case of chronic pancreatitis, the pancreas can be hyperechoic or heterogeneous (hyper- and hypoechoic areas) and thickened with peripancreatic inflammatory changes. One can see pancreatic ductal dilation in cats with chronic pancreatitis, although as mentioned above, age-related dilation is commonly seen in older cats. FIGURE 13. Pancreatitis resulting in an extrahepatic biliary duct obstruction in a dog. The bile duct (BD) is abnormally dilated secondary to inflammation of the pancreas at the level of the entrance of the bile duct into the major duodenal papilla (not shown in this image). 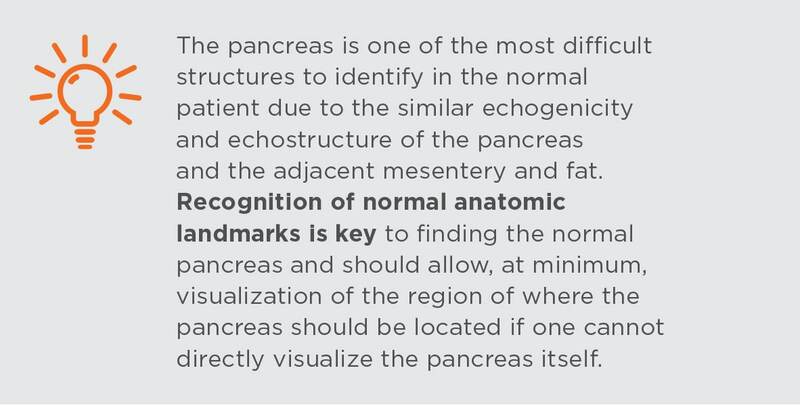 There is marked enlargement of the right lobe of the pancreas with a mass effect (MA) relative to the body of the pancreas (PA). Pancreatic duct dilation (PD) is also noted. It may be difficult to differentiate pancreatic neoplasia from abscesses, necrosis, and acute pancreatitis. Adenocarcinomas form hypoechoic or heterogeneous pancreatic masses without evidence of peripancreatic inflammation. These tumors have been shown to develop within the body of the pancreas; they can compress the bile duct, invade adjacent gastrointestinal structures, and have frequent metastases to the liver (there the nodules may be target-like in appearance, with a hypoechoic rim and iso- to hyperechoic center). The mass(es) may have dystrophic mineralization associated with the tumor. Signs of malignancy of pancreatic neoplasms include lymphadenopathy and metastasis to other abdominal organs or to the mesentery and peritoneal surfaces (ie, carcinomatosis). In the case of carcinomatosis, hypoechoic nodules will be seen along the parietal and visceral peritoneal surfaces (FIGURE 14). Cats with pancreatic carcinomatosis, will often present with a distended abdomen due to a significant effusion. and cats include cystadenoma, metastatic carcinoma, and lymphoma. FIGURE 14. Pancreatic hypoechoic mass (MA) that measures 2 x 4 cm in a cat diagnosed on fine needle aspirate with pancreatic adenocarcinoma (A). Multiple hypoechoic nodules (No) are present throughout the mesentery (ME, visceral peritoneal) surfaces (B). A small amount of peritoneal effusion is present (EF) in this image. Although rare, endocrine tumors (eg, insulinoma) occur as hypoechoic nodules to masses within the pancreatic parenchyma. By the time of insulinoma diagnosis, metastasis has often already occurred, and careful examination of the regional lymph nodes and liver is necessary in these cases to identify metastatic lesions. Lymph nodes with metastases will be enlarged and hypoechoic. As with pancreatic carcinoma, insulinoma metastases may form hypoechoic or target-like lesions in the hepatic parenchyma (FIGURE 15). 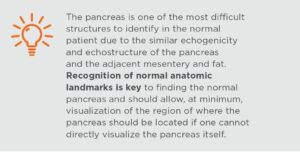 A systematic examination of the pancreas based on normal anatomy is a routine part of the complete abdominal ultrasound evaluation. 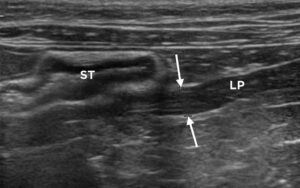 Common pancreatic abnormalities in the dog and cat may not be immediately apparent on ultrasonography, therefore, recheck ultrasound scans or other diagnostics may be indicated in some patients. FIGURE 15. Hypoechoic, lobulated, 1.5 cm nodule (MA) measuring 1.7 x 2.3 cm in the body of the pancreas (A) with multiple target-like lesions (white arrows) noted on long axis throughout the liver of an older dog (B). On fine needle aspirates of the pancreatic and hepatic nodules, a metastatic neuroendocrine tumor consistent with an insulinoma was identified. ST, stomach. Penninck DG, Zeyen U, Taeymans O, Webster CR. 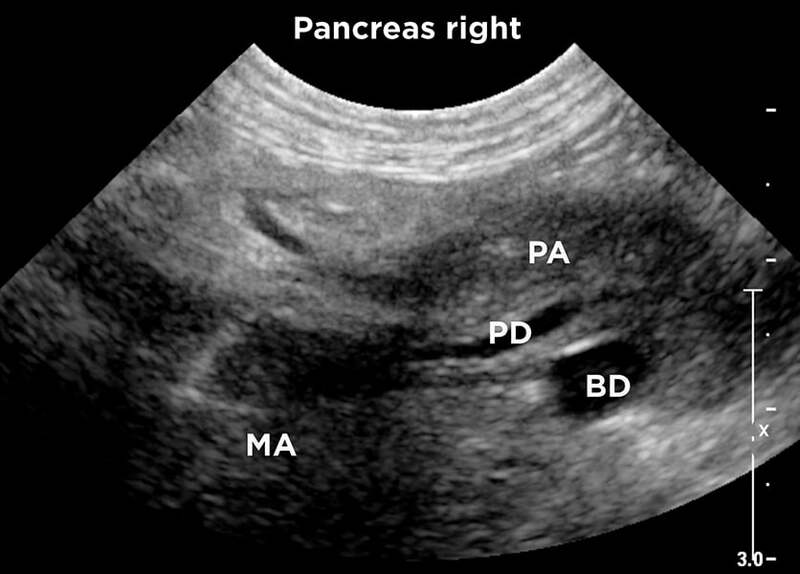 Ultrasonographic measurement of the pancreas and pancreatic duct in clinically normal dogs. Am J Vet Res 2013;74(3):433-437. Hecht S, Penninck DG, Keating JH. Imaging findings in pancreatic neoplasia and nodular hyperplasia in 19 cats. Vet Radiol Ultrasound 2007;48(1):45-50. Larson MM, Panciera DL, Ward DL, et al. Age-related changes in the ultrasound appearance of the normal feline pancreas. Vet Radiol Ultrasound 2005;46(3):138-142. Etue SM, Penninck DG, Labato MA, et al. 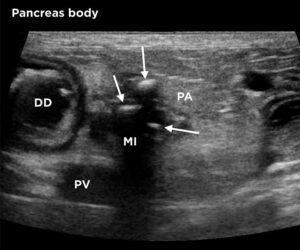 Ultrasonography of the normal feline pancreas and associated anatomical landmarks: a prospective study of 20 cats. Vet Radiol Ultrasound 2001;42(4):330-336. Edwards DF, Bauer MS, Walker MA, et al. Pancreatic masses in seven dogs following acute pancreatitis. J Am Anim Hosp Assoc 1990;26(2):189-198. Lamb CR. Pancreatic edema in dogs with hypoalbuminemia and portal hypertension. J Vet Intern Med 1999;13(5):498-500. Lamb CR, Simpson KW, Boswood A, Matthewman LA. Ultrasonography of pancreatic neoplasia in the dog: a retrospective review of 16 cases. Vet Rec 1995;137(3):65-68.